SSC CGL Tier 1 Exam Analysis 6th August 2017 Slot 1 – Check here today SSC CGL question paper review, cut off, Good attempts etc. SSC CGL Tier 1 Exam Analysis 6th August 2017 Slot 1- SSC CGL’s second day has started and students are again ready for a new day of surprises. 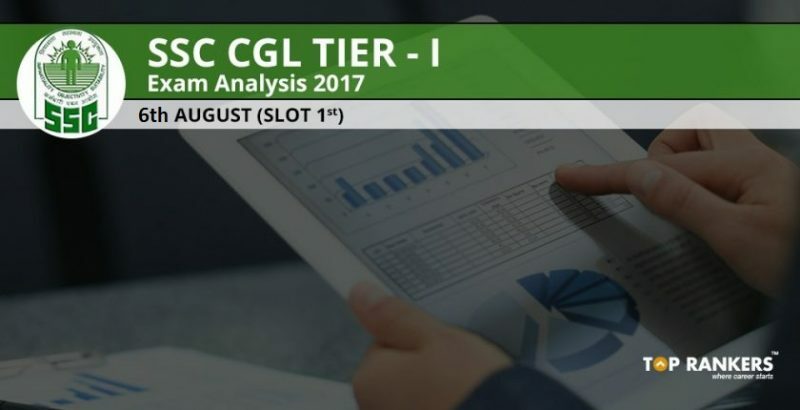 Students are awaiting for the SSC CGL Tier 1 Exam Analysis of 6th August 2017 Slot 1 and we, after receiving requests from students, present you the complete analysis of slot 1. This analysis is a result of assembling data we collected from various exam centres and feedback from students. SSC CGL Tier 1 Exam Analysis 6th August 2017 Shift 1- Section – wise exam review : Given below is the section – wise exam analysis of SSC CGL Tier 1 6th August 2017 Shift 1 exam. Stay tuned for more updates on SSC CGL Tier 1 Exam Analysis 6th August 2017 Slot 1 & upcoming slots. All the best!